John Bonham (1948/1980) is one of the most inventive and virtuoso rock drummers in history. 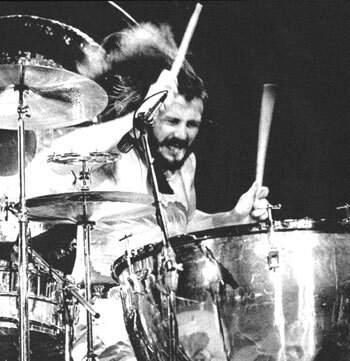 He is one of the first to master at this level hits alternatings with hands as well as with the feet (such as the roll with one hand stroke and two kicks (hyper-fast heel-toe), made famous by the song "Good Times, Bad Times" (1969) from Led Zeppelin, which is even played by Dennis Chambers in demo) and the 3 limbs roll (right hand, left hand, right foot) at a staggering speed. 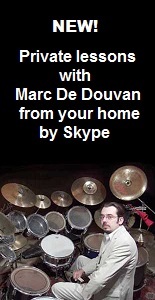 His powerful and very constructed playing while being subtle (ghost notes, ruffs, triplets) will inspire hard rock, metal and progressive rock drummers, as much as contemporary jazz or funk drummers, like Dave Weckl , or even rap samples. John marks certainly a milestone in the forms of virtuoso drumset playing. Some consider him as the inventor of the hard rock drumming.